The 30th James L. Waters Annual Symposium will take place on Monday, March 18 in Philadelphia as part of Pittcon 2019. The theme of this year’s Symposium focuses on early research efforts required to develop Ultra High Pressure Liquid Chromatography (UHPLC) and the impact that the adoption of this technology had on the analytical chemistry community. I am honored to be one of five invited speakers. For my talk titled “If You Build It, They Will Come”, I will discuss some of the key technical challenges Waters faced in commercializing a robust UHPLC system. The 2019 Session coincides with the 15-year anniversary of Waters’ introduction of the industry’s first UHPLC system to the scientific world in the form of the ACQUITY UPLC System and ACQUITY UPLC BEH Columns. At Pittcon 2004 in Chicago, scientists got their first look at a hardened, low dispersion, purposefully-built instrument that could harness the power of an analytical column packed with sub-two-micron particles. The performance attributes of resolution, speed and sensitivity were unlike anything seen before from a chromatography system. The journey to get to that point began several years earlier when the Waters R&D team set the plans for Waters ACQUITY UPLC System in motion. Bruce Compton, then Director of R&D, had an occasion to visit Prof. Jim Jorgensen at the University of North Carolina. At the time, Prof. Jorgenson’s group had begun to explore higher-pressure chromatography using small particles for better performance. Upon his return, Bruce and I discussed the value that a commercial system could bring, and we began exploring how to develop a working prototype that could be readily manufactured. Shortly thereafter, we initiated a collaboration with Jim and his students. 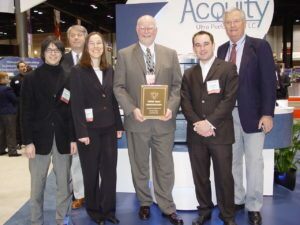 The Waters R&D Project Team with the R&D 100 Award received for ACQUITY UPLC in 2004. – Instrument Business Outlook Newsletter, March 15, 2004. “Waters saw a wider use for the particles we were working on,” Jim Jorgensen says. “We would never have gotten anywhere were it not for them,” says Jorgensen of those days. ACQUITY UPLC was awarded the Pittcon 2004 Editors Gold Award for Best New Product. Shown is Waters’ product manager, John Morawski (center), with members of the industry trade media. Not only were there technical hurdles, but organizational challenges as well. The business risks were substantial, and the venture raised many questions. Could we commercialize a product fast enough? Would laboratories buy a system that would operate at backpressures substantially higher than what they were accustomed to? Could we sell it at a price that allowed us to make a profit? Would it cannibalize our other products? Pushing UPLC as hard as we did on the organization wasn’t without its personal and professional risks either. Our task was to turn people at all levels of the organization into believers in the technology. We needed to convince leadership to fund and resource, – at great expense – parallel development projects so we could learn how to synthesize the particles and engineer a liquid chromatography system that could harness their power. That first ACQUITY UPLC System opened the door to a flood of innovation that continues to shape separations science today. And Pittcon is where it all began.